Whether you want to prepare your turkey for Thanksgiving or for an everyday meal, you want to know how to cook it right. Your turkey will come with instructions, but only on how to heat it in the oven. 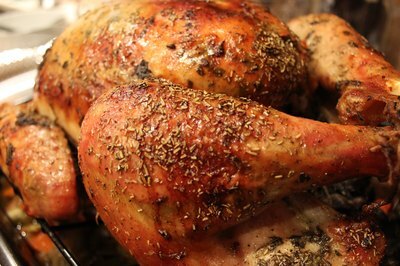 Even if you cook it properly, your turkey may still come out of the oven dry or overcooked. With the right ingredients and a little extra attention, you can prevent your turkey from drying out. Take the turkey out of the refrigerator. Bring it to room temperature, while keeping it in its wrapping. If you have a frozen turkey, place it in a pan or on a plate and allow it to defrost in the fridge, several days before cooking. You will need to defrost it for 5 hours for every pound. Remove the plastic wrapping from the turkey. Take out the neck and the giblets -- heart, gizzard and liver. 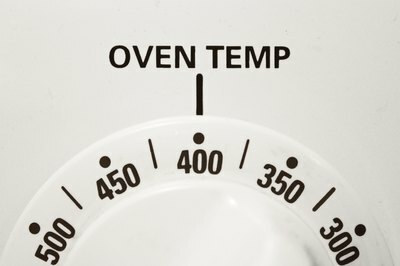 Preheat the oven to 400 degrees F.
Wash the turkey with water. Pat it dry with a paper towel. For flavor, add carrots, the juice of a lemon or salt inside the turkey. Tie up the legs with string or metal skewers. Stuff the neck portion with parsley, if desired. Tie it up with string or metal skewers. Rub melted butter or olive oil all over the turkey. Sprinkle salt and pepper all over the turkey. 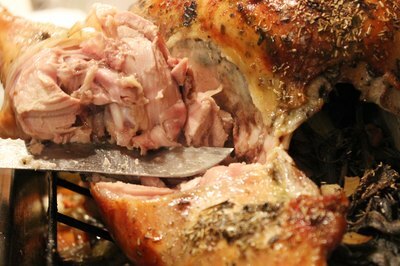 Place the turkey, breast down, over a rack with a roasting pan, for it to catch all the juices. Place it in the oven. Check the packaging for cooking directions. Remove the turkey from the oven, once done. Let it sit on the counter for 15 to 20 minutes. Turn it breast side up to carve it. Save the heart and gizzard for making stock for your stuffing. Use the neck for making turkey soup. Add fresh thyme or rosemary to the outside to your turkey for added flavor, before putting it in the oven. Avoid contaminating other foods. Always wash your hands with soap and water, and clean with paper towels. Always use oven mitts when taking the turkey in and out of the oven. How to roast a turkey breast with a handful of simple ingredients and just three easy-to-follow steps.